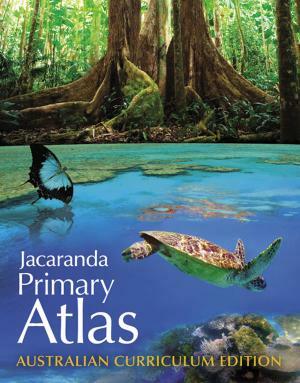 The Jacaranda Primary Atlas 4E for the Australian Curriculum has taken up the exciting opportunity to revise its contents to meet the requirements of the Australian Curriculum: Geography. Retaining its mapping excellence and graded skill development, the atlas presents a wealth of gazetteer and thematic maps, new case studies and fully updated statistics that address the curriculum content descriptions for Years 3-6. • Students are encouraged to be active and informed citizens through a Let’s help feature. • Students are introduced to basic map interpretation and geospatial skills through stimulating resources and activities. • Skill development is reinforced with a range of activities. Satellite images of continents give students a bird’s-eye view of the world, while new case studies explore natural and human features, geographical and cultural diversity and issues relating to the ways humans interact with their environments. Additional thematic pages provide an engaging reference on topics such as climate, endangered species, culture and World Heritage. This section comprehensively informs students about their own country. Detailed maps of each state and territory are supported by Geofacts and case studies appropriate to primary school students and curriculum themes. Australia’s natural and human features, resources and their sustainable use, care for special places, Aboriginal and Torres Strait Islander cultures and our connections with other countries are featured throughout this section. QR codes feature throughout the Atlas so students and teachers can quickly access relevant online content and weblinks. Simply scan the QR code with an iPad or tablet to access the web material.